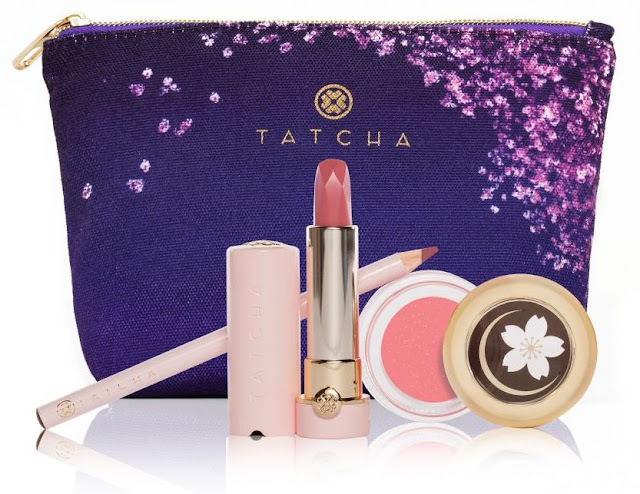 The new TATCHA LIMITED EDITION Cherry Blossom Lip Trio is something that you won't want to miss if you love the TATCHA! $85.00 ($118.00 Value) from TATCHA. TWILIGHT: A Cherry Blossom Lip Trio is a modern evolution of the perfect shape of the geisha’s lips. Silk and Cherry Blossom extracts nourish for a petal-soft finish, while 23-karat gold adds a touch of glamour. TWILIGHT: A Cherry Blossom Contouring Lip Liner. This long-wearing liner glides on to give shape, depth and definition to lips in the perfect shade for contouring. TWILIGHT: A Cherry Blossom Silk Lipstick. This universally flattering lipstick lends a pink blush to lips with a creamy sheen. CHERRY BLOSSOM Camellia Lip Balm. This luxurious lip balm rich in Camellia Oil leaves lips looking plump and nourished with a sheer blush. ELEGANT CANVAS COSMETIC POUCH: This custom bag features a unique design of cherry blossoms at twilight. Dimensions: 8in. x 5.5in. x 2in. $85.00 ($118.00 Value) from TATCHA (Affiliate Links). I really like the Tatcha products. I have both lipsticks. I am intrigued by the lip liner with this set. The tinted balm I'm not so sure about- I love my clear balm and it's personal preference not to want a tinted finger tip. Thank you for your reviews and swatches. I do too! Their products are amazing! I only have their Plum Blossom Lipstick, and it is one of my all-time favorite lipsticks! I am very tempted by this set, and I think that all three would be amazing together. You could use a lip brush to place the tinted balm on top of the lipstick, or the liner (or both)– if you want to avoid tinted fingers! You are so welcome for my review and swatches!! Let me know if you end up getting this because I would love to hear what you think about it! I will be sure to do the same! Oh no, I'm almost afraid to look - a new Cherry Blossom pink lipstick from Tatcha in a pink case no less! It looks very lovely though thankfully for my wallet maybe close enough to my mauve-pink lipstick from Tatcha that I adore. I know what you mean! I am seriously contemplating this set! I suspect that it is quite a bit lighter than Plum Blossom. I'm sure these are just incredible since Tatcha doesn't do anything less than the best. I agree with you, Marcia! love this set! does anyone happen to know when it will become available? thanks!! I have not heard about the date yet, but I suspect that it will be available before Mother's Day! I will let you know if I hear anything!